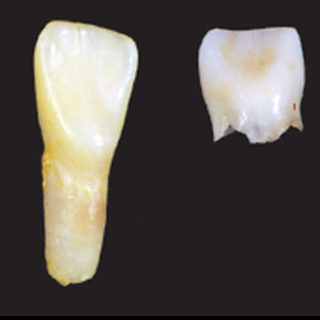 Left: Incisor with root intact from patient with hypophosphatasia. Right: Incisor with root absorbed. Foster BL, Ramnitz MS, Gafni RI, et al. Rare bone diseases and their dental, oral, and craniofacial manifestations. J Dent Res. 2014 Jul;93(suppl 7):7S-19S.